IMPORTANT: The following is intended to be tongue in cheek and not in the slightest bit disrespectful to any of the companies or organizations involved, or to the UAE in general. Getting apparently simple things done here may sometimes be chaotic, illogical, frustrating and surreal, but at the end of the day everything falls into place, and importantly everyone keeps smiling. Not sure you’d get that in the UK or many other countries. Having got that out of the way, let us begin……….. They thought they’d got away with it. They didn’t think I would work it out. But they went too far. Who are “they” you ask? I’ll tell you that later but first let me present the evidence and I am sure you will come to the same conclusion as me. The story begins a week ago when we realized that if we wanted wifi coverage around the whole house we needed to get our main router moved upstairs from the lounge. A simple job we thought. A quick phone call to the broadband provider, schedule a visit at a convenient time, a simple explanation of what was required, then 15 minutes later, job done. It started well. A phone call established that the service we needed was “internal shifting” (as opposed to “external shifting” if we were moving house). A visit was scheduled for a reasonably convenient time, and we sat back, confident that all would be sorted quickly. As normal in these parts the engineer called a few minutes before the allotted time to ask where we lived. “Villa 1 2 3 4”. “Ok sir, villa 1 3 4 7, I’m there in ten minutes”. “No, wait, it’s villa 1 2 3 4”. “Yes sir, villa 1 6 3 9, ten minutes sir”. You get the gist. A few more minutes of villa number tennis and finally we talked him in. “Good evening sir, you need external shifting sir?”. “No, we need internal shifting, broadband upstairs, with a connection downstairs for TV, and keep the phone line downstairs please”. “Ok sir, broadband and phone upstairs, where do you want the TV?”. This continued for a few more minutes until we finally established a common understanding of our requirements. Then I noticed he didn’t have any tools with him. “Oh no sir, I just check requirements, next engineer comes”. Two days later the engineer arrived (“villa number sir?”). “Good evening sir, external shifting?”. Five minutes later, requirements now understood, I noticed that he too had no tools with him. “No sir, first cabling team comes. Put new cables in then team comes to move box”. I won’t bore you with too much more of the saga. The next few days were a saga of countless phone calls, missed appointments, the cabling team finally turning up to do their bit of the job, then returning the following day ready to do it again, and to cap it all a call from one of the engineers asking me to dismantle the main box because he had plugged one of the cables into the wrong socket and now none of the broadband, TV or phone were working. And every time a new engineer called to say he was on the way – another game of villa number tennis and another explanation of what we required (“no, not external shifting, internal shifting”). By mid week my patience was running low, and then it got worse. The peak of “shifting-gate” coincided with the final stage of the process of getting my degree “equalized”. This saga started some weeks ago, when I had to dig out my high school exam certificates, have them translated to Arabic, sent back to the UK to be confirmed as genuine (which involved the embassy and various UK government departments from what I can tell), returned to Abu Dhabi and submitted to the relevant authority to confirm they would have been sufficient to get me into university here to study for a degree. This involved a lengthy phone call to explain the UK exam system of the 1980s to someone, which resulted in several bewildered comments about my advanced age. Once it had been established I would have been eligible to go to university here (phew) I had to prove that I got a meaningful degree. No comments about hotel and catering management not being meaningful please. In theory you can submit this part of the application online but it has to be the least user friendly online form I have ever seen, so I decided it would be easier to go into the local office of the relevant body. I called in on my way to work, arriving bang on the publicised opening time. I arrived at the customer service centre to find it deserted except for a solitary security guard. Looking at me slightly oddly he explained that the actual opening time was 30 minutes later than the publicised time, but would be even later today because it was foggy outside. Determined not to be defeated I sat down to wait. The “official” opening time came and went, more time passed and just as I was about to give up in sauntered a customer service agent. On hearing why I was there, he seemed to find it quite strange, making me feel I was the first person ever to ask for such a service. Another explanation of the UK education system was required but to be fair he was then very helpful. Until the point where I needed to print one of the required documents. Given that the service centre was full of computer terminals and printers I thought this would be straightforward, but after ten minutes of a computer technician, security guard and the customer service agent discussing the matter they decided they didn’t know how to make the computer link to the printer. After much head scratching a USB stick was found and another hurdle was cleared. Next he wanted me to provide details of the hours and subjects of lectures my degree involved. I didn’t think it was appropriate to explain how every Wednesday morning I spent two hours doing wine tasting, and every Monday afternoon I was cooking. Instead I explained that as my degree was nearly 30 years ago it was quite hard to remember exactly what I did each day (nothing to do with the wine tasting, honest). More head scratching but then inspiration struck and he made me write down on a blank sheet of paper “I certify that I cannot remember the hours or exact subjects I studied because my degree was so long ago”. We both signed the sheet of paper, he gave it an official stamp and all seemed well with the world. Ten more minutes and I walked out clutching an official receipt with a promise that they will call me when they have considered my application. My patience was now at breaking point. The straw that broke the camel’s back? As I arrived in the office 20 minutes later I received an SMS from a courier company telling me they had a parcel for me and could I please phone the provided number to schedule a suitable time and place. I sat down and dialled the number. Thus began another tale of phone calls to helplines (“no sir, the reference you have been given is not valid”) and confused delivery instructions (“villa number sir?”). But eventually two days later the tickets were safely in my possession. So you see now don’t you? You get it. The only possible explanation is that the “they” I referred to earlier are the producers of an Abu Dhabi based reality show. They have obviously been streaming the whole thing live to a TV audience who are submitting ideas about how to wind me up next. I’ve seen the film. I am clearly starring in my own version of “The Truman Show”. Oh and before I go – did you see that NASA recently released thousands of previously unseen photographs from the “moon” landings? Have a look at them and see if you don’t agree with me that they clearly show the whole thing was a fake. Right, well some men in white jackets have just pulled up outside, so I’d better go and see what they want. 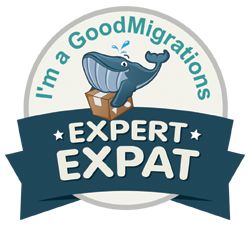 If you enjoyed this post why not “like” the Quantified Expat page on Facebook? Just click on the link to the right of the post. I’d be very grateful.